When Seb was around 12 weeks old we started to notice that something wasn’t right. Seb’s head was flat at the back, his forehead was pronounced and there was a bulging to either side of his head over his ears. I raised these concerns with our Health Visitor who told me, “it will probably be alright by the time he’s about four years old and, if not, his hair will cover it up”. Needless to say, we were not comfortable with this response. It was such a ‘what if’ type scenario and where your little one is concerned, you like to try and do everything you can to make sure things are right for them. I was lucky enough to find out about Technology in Motion through a very good friend of mine. 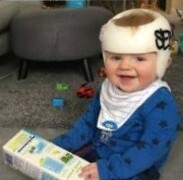 Her little boy had plagiocephaly and was wearing a helmet, so I was able to find out all about the clinic and what they do before looking into them myself. When I first contacted Technology in Motion, they suggested we take photos of Seb’s head for a period of six weeks, in order to see whether we thought the repositioning techniques and Mimos pillow we were using were making any difference. Although the pillow and tummy time helped initially, as soon as Seb could roll around in bed, the improvements soon came to a halt. When Seb was 6 months old, we went to our local Technology in Motion clinic for our free initial consultation with Sandie. After hearing that Seb fell into the severe category, we were both convinced it was the right option for us. Our journey was very straightforward. Seb had no difficulties whatsoever wearing his TiMband (we left it off for one or two days when he was poorly, but apart from that he wore it day and night for five months with no issues). As he came to the end of his journey, we had to speak to Sandie with regards to small red marks appearing, but this was due to the helmet getting tight – an indication it was time for it to come off. My husband and I were both really pleased with the results at the end of treatment. We had been informed in advance that it was unlikely we would get into the green area on his severity graph, but I think it is too easy to get swept up in the numbers. The before and after photos and measurements from Technology in Motion spoke for themselves! Thank you Technology in Motion.